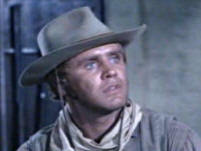 John Cannon drives gold seekers from an abandoned mine on his land and they retaliate by plotting to kill the Cannons. Story Line: Lije Driskill, Johnny Faro and Shorty Bleeson fail in an attempt to kill Buck, Sam and Victoria, who are driving back to the ranch with dynamite to use at the mine. Driskill and his companions then raid the ranch and drive off the cattle. Buck, realizing he has misinterpreted Victoria’s friendly overtures as something more, leaves to dynamite the mine, intending to make it his final job for John. 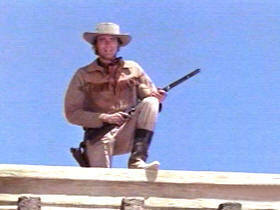 Billy Blue rides to bring Buck back, but is captured by Driskill, who plans to kill the young man. Character Highlights: By laying down the law with Buck and Blue about their cleanliness at the dinner table, Victoria is struggling to assert her position as mistress of the household while trying to also please John, who is reluctant to give up any control. John is caught between allegiance to his new wife and to his brother and son. They are still calling each other "Mr. and Mrs. Cannon". Victoria turns to Buck for understanding and tells him sometimes she wishes her husband were more like him. 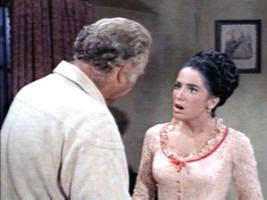 In a series of misinterpreted gestures, Buck is attracted to Victoria and believes the feelings are shared. When he discovers they are not after an aborted attempt to kiss her, he is embarrassed enough to feel that he must leave the ranch for good. In a turn-about, it is Blue who heads into danger to retrieve Buck. Reno plays and sings in this episode. John has some pretty cornball lines about the evils of gold and gold seekers. Reno is hardly through begging Big John to release him from watch duty on the roof, assuring the boss that there is no one in sight, when he suddenly fires his rifle and hollers the rallying cry, "Injuns!" As the men roll the buckboard across the ranch entrance and get into position for a fight, they watch in wonder as a lone Indian races toward them. Hot on his trail are three white men. As the Indian and horse fly over the fence into the ranch, he is shot by one of his pursuers and falls to the ground. Before the three can reach him, Big John is pointing his rifle. Reno, asking for relief from watch duty. Buck sends Alacran on his way. Lije Driskill introduces himself and his two companions, Faro and Bleeson. Bleeson explains that he had staked a claim on a glory hole of a gold mine in Los Animas Canyon and was innocently working it when the Indian came along and shot at him. 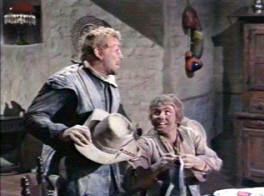 John tells him gruffly that the canyon is on his land, and that if he catches Bleeson working the claim or on any other part of High Chaparral land, he’ll be buried there. 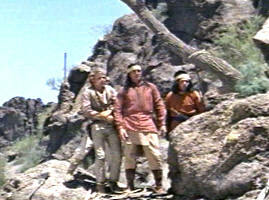 While Mano and Blue help the Indian mount up, John instructs Mano to tell the brave, Alacran, of his message to Cochise - he is going to bring peace to the Apaches if he has to break Cochise’s neck to do it. Mano takes some liberties with his translation. Vaquero leads John and Buck to the entrance of the mine. John wants it blown up. While Buck offers that gold can be a good thing, John insists that it has a way of fouling up the land. Back at the ranch, Victoria and John, addressing each other as Mr. and Mrs. Cannon, have begun supper without Buck and Blue. Victoria asks her husband if he could perhaps persuade his brother and son to take a little of their dirt off before they come to the table. Just as John assures her that he’s already spoken to them and she doesn’t have a thing to worry about, the missing pair arrive, covered from head to toe in dirt and dust. Buck cheerfully illustrates how dusty they are by blowing a large cloud on to the table. Victoria shouts that she will not stand for it and rushes from the table. After listening to John’s lecture, Blue storms out to eat in the bunk house where no one is particular about how a man smells. Shortly Buck, and then Mano, join him, leaving John to finish his meal alone. she were hired help in her own house. John goes to Victoria. He wants a clear understanding that she does not have the right to tell his brother and his son what to do in his house. While he has told the pair that they were in the wrong, he will not take them to task in front of a woman. And furthermore, she has to learn to live with his rules. Victoria explodes, calling him a brute of a husband. She is the mistress of the house and demands to be treated like one. And until he can learn to do so, he can just keep his distance. Once outside, Victoria is more upset than angry. Buck passes her warily, then stops and apologizes. Even the bunkhouse men had teased him about his dirty appearance. 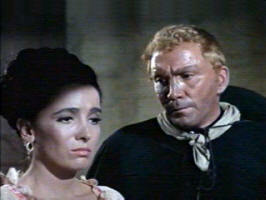 Victoria confides in him that she doesn’t think John likes her very much. When Buck tells her that Blue thinks she is the best and that he himself thinks the world of her, Victoria kisses him on the cheek, saying that she sometimes wishes her husband was more like him. The next day, Victoria is going into Tucson. John not only tells her that he was wrong, but that she looks pretty. When an obviously hung-over Buck complains about having to go along, Victoria tells him that she wouldn’t go without him, perking him up considerably. While Victoria is shopping for some very gaudy shirts for Buck and Blue to wear to the supper table, Buck and Sam go into the saloon. Driskill, Faro and Bleeson follow them in, leaving their Indian companion, Black Dog, outside. Buck prepares to take on Driskill. Buck offers to buy drinks for the house, but Driskill announces loudly that they don’t drink with Injun lovers. Buck prepares himself for an enjoyable fight. The bigger man, Driskill soon sends him sprawling into the street. But Buck returns and knocks him out with a whiskey bottle over the head. "I want them dead," Driskill growls to Black Dog. are under fire. On the ride home, Sam informs Buck that they aren’t alone. Black Dog has brought more Indians who are heavily armed. Hiding in the entrance to the mine, they are out numbered and almost surrounded. But Sam draws their fire while Buck prepares the blasting powder purchased in Tucson. The explosions scatter the Indians. Victoria embraces Buck and gives him another heartfelt kiss on the cheek. That night, while Reno strums his guitar and sings, Buck is deep in troubled thought. Sam asks him what’s wrong, even offers him a "knock" from a jug that he has stashed. He’s more than a little surprised to be turned down, but leaves Buck to his thoughts. Pedro fires a shot from the water tower and Ira rushes into the house with the news. Apaches are running off one of the canyon herds. 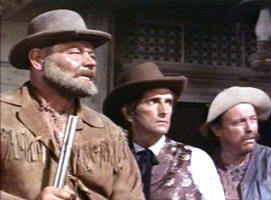 Big John instructs Buck to stay with Victoria while he and the rest of the men ride off. An Apache is inside the fence and he sees the pair hiding. When he fires a shot through the window at them, Buck fires back and kills him. Victoria kisses him in thanks for saving her again. Inches from her face, Buck hesitates for a second, then moves to give her a real kiss. She pulls away in surprise, telling him no. She asks him gently what he’s doing. Buck says he doesn’t know, that she’s got to tell him. He’s never back shot a man and when it’s his own brother . . . . Victoria apologizes that she’s led him to believe she wanted more than friendship from him. Buck says "adios" and she realizes he means it for good. He babbles on uncomfortably about keeping in touch and says he’ll blow up the mine on his way. Then he rushes from the room. Buck starts to kiss Victoria. Big John and his men find an Indian with arrows in his back. But the arrows are Pima, not Apache. He realizes then that it’s a trap, and sends Blue home to tell Buck that "the three yahoos" are going to try to stake out the mine. Blue promises to bring Buck back. Victoria has the sad task of telling Blue that Buck is gone and not coming back. She says it was all her fault – a misunderstanding. She asks Blue to go after him and tell him that everything is all right and that she begs him to come back. Surprised by her intensity, Blue tells her that he’ll get him. There are Indians on the mountain overlooking the mine when Blue arrives, but he doesn’t see them. He is immediately overtaken by Driskill, Faro and Bleeson. They string him up by his heels from a tree, and start a fire under his head. "That’s pure Apache," says Bleeson. Surely Big John will think that Cochise is to blame. But Buck sees it all. "Blue Boy, how can you forget everything your Uncle Buck has taught you?" he wonders out loud. after rescuing Blue. When Blue is roasting over an open flame, Buck fires, scattering the trio. The Apaches ride in and release Blue. One of them is Alacran, the Apache they protected earlier. He and Buck acknowledge each other. Big John, Mano and Sam see an explosion in the distance. As they reach the mine, Buck and Blue are adding crosses to the graves of the claim jumpers. 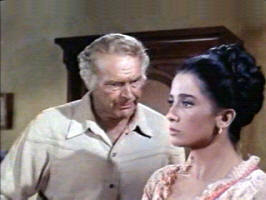 John wants to know why Victoria thinks Buck is leaving the High Chaparral. Women never get anything right, says Buck. They worry too much. Let’s go home, says John. Back at the ranch, its supper time again and Blue is wearing his new shirt and a tie. Buck appears on the landing, so uncomfortable in his new brightly colored shirt and tie. He nervously picks at imagined dirt, is not quite sure what to do with his hat. His hair is parted neatly in the middle and slicked back. John manages to turn his laughter into a cough. Blue and Mano are not so successful. But Victoria gets up and welcomes Buck back, taking his arm and kissing his cheek. 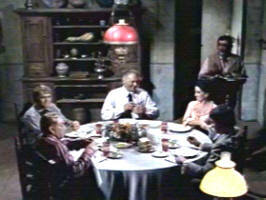 As John pulls out a chair for his wife, they begin their civilized meal. Back for supper in new, clean outfits. Director of Photography: Harold Stine, A.S.C. Art Direction: Hal Pereira & McClure Capps Edited by Argyle Nelson, Jr.